The National Matches, considered America's "World Series of the Shooting Sports", have been a tradition at Camp Perry, Ohio since 1907. Each summer, the nation's finest civilian and military marksmen and women square off for five weeks of rifle and handgun competition in a variety of formats and events. Camp Perry was named after Commodore Oliver Hazard Perry, the victorious American Commander who defeated the British in 1813 in the Battle of Lake Erie. The Ohio Legislature officially names the Camp on May 1, 1908. The need for the Camp was established during the Spanish-American War of 1898 when American naval gunnery and marksmanship skills proved to be deficient. In response, a Congressional Act of 1903 gave federal funding assistance to those state militias providing marksmanship instruction camps and practice rifle matches. While duck hunting in the marshes along Lake Erie in 1905 General Ammon B. Critchfield, Adjutant General for the State of Ohio, located an ideal range site where all firing could be done from a common line directed toward the shoreline, maximizing natural light conditions. In 1906, the State Legislature appropriated $25,000 to purchase over 300 acres of land for the state rifle range and camp. By the summer of 1907, the 200-, 600-, and 800-yard ranges were ready with parapets and 160 targets. During September, the National Rifle Matches were first held at the Camp. By 1909, Camp Perry evolved into permanent camp with the largest and best equipped rifle and pistol ranges in the United States, if not the world. Four major ranges provided a total of 210 rifle and 20 revolver targets, all of which could be operated simultaneously. The large mess hall was completed in 1909 using a new method of erecting pre-cast concrete walls. Construction continued during the 1920's. Eighteen company-sized frame mess halls were built. Later these were replaces by concrete clock construction. In addition, a landing field was constructed for the aircraft of the Observation Squadron. During the Depression, Words Progress Administration funds provided for the brick construction of the Commercial Center of Arcade, the Post Theatre and the Post Headquarters Building. 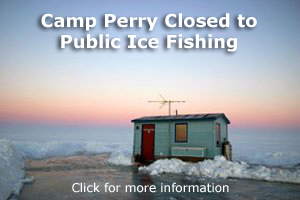 Camp Perry has played a role in federal service. During World War I it was used as a training center for officers and marksmanship instructors. The adjutant Erie Ordnance Depot west of Camp Perry was used to support weapons testing and development for the war effort. During World War II, Camp Perry also served as a reception center for the new recruits and as a POW camp to house the many German and Italian prisoners of war. Many tar paper covered hutments constructed for housing these prisoners are still standing. Recently the construction of 200-person barracks and DCM (Director of Civilian Marksmanship) housing have replaces some of these huts. After the war, camp usage decreased. However, the usage of the camp increased during the National Matches in 1968. Weekend range firing and use by civilian rifle teams has steadily increased. The complex is also used daily by non-military agencies. During the 1980's camp usage and new building projects continued. Barracks construction, new classroom facilities and a covered firing range were significant achievements of the decade. With new projects planned for the 1990's the continuation of Army training requirements through the year 2000, and the predicted growth of the National Matches, Camp Perry will continue to provide civilian and military support into its second century of service. The advent of WWII called the camp to "Active Duty". Camp Perry became a Reception Center for induction of draftees. On September 30, 1943 Camp Perry was designated as a Prisoner of War camp. At one time the camp housed approximately 2,500 German and 2,000 Italian POW's. This building was constructed for use by the Adjutant General of Ohio and his staff. Completed June 1938, at an approximate cost of $33,000 the building contains 14 rooms, a fire station, basement, and attic. The building now contains offices for the Camp Commander. The theatre was built of wire-cut brick and has a seating capacity of 1,000. Architect Harry C. Holbrook of Columbus, Ohio drew the plans for the building which was completed by the WPA in June 1938 at an approximate cost of $70,000. When the Arcade was built in 1936 at an approximate cost of $78,000, it was known as the Commercial Center Building. The "Y" shaped building housed the PX, Post Office, Western Union, Barber Shop, YMCA, and Telephone Exchange. On September 6, 1936 the monument in front of Building 3 was unveiled as a tribute to Brigadier General Ammon B. Critchfield from Shreve, Ohio, the founder of Camp Perry. The Arcade houses Bataan Armory with its World War II memorabilia collection, the 213th maintenance company, Sea Grant of Ohio, Post Exchange 145th MASH mobile army surgical hospital and the snack bar. On November 25, 1984, the Armory was officially named "Bataan Armory" in honor of the men of Company 'C', 192nd Tank BN who were captured on April 9, 1942 with the fall of Bataan and were Prisoners of War for 3 1/2 years. The brick Post Chapel was officially opened and dedicated by Captain Roy H. Cox on Sunday, August 8, 1943. Built in 1907 by the Ohio Rifle Association the Clubhouse was purchased by the State of Ohio in 1921. Today, the Clubhouse office rents cottages, motels and recreational vehicle space to visitors and military personnel. In 1993 the original Clubhouse was burned down by a controlled fire and rebuilt as the current Conference Center in 1996. The flagpole was erected on July 13, 1911. It was originally the main mast of the U.S. Sloop of War "Essex", a wooden screw steamer commissioned at Boston Navy Yard on October 3, 1876. The original flag pole was damaged on June 24, 1998 and was removed and replaced with the current flag poles. The Plaque, shaped like the State of Ohio was placed on the plaza as a tribute to members of Company C, 192nd Tank Battalion on the forty-fourth anniversary, in 1984, of their mobilization. Thirty-two of the forty-two men who left Port Clinton for Fort Knox, Kentucky in November 1940 were with the unit on the Bataan Peninsula. Only a few survived the Bataan Death March and 3 1/2 years as Prisoners of War. The tank, similar to an M3 Stuart Light used by the tank company in the Philippines, was given to Camp Perry by the citizens of Dunkirk, Ohio and was accepted by John L. Short on behalf of Company C.
The railcar is one of 49 sent to the United States by France in 1949. The cars arrived in New York in January loaded with gifts as a gesture of friendship and gratitude from the French people. It was transferred to Camp Perry in 1951. On November 11, 1986, a restoration dedication ceremony was held. The box car is also known as the Forty and Eight because it could transport 40 men and 8 horses.